e-payment mode i.e. making payment by using the electronic mode. In this part, you can gain knowledge about various provisions relating to e-payment of various direct taxes. All taxpayers other than company who are liable to get their accounts audited as per section 44AB. E- payment is time saving, simple, safe and this facility can be used at any time from anywhere. For making e-payment of taxes one should have only two things, an internet connection and a net banking enabled account in an authorised bank. If the taxpayer does not have a net banking enabled account, then he can make e-payment using a net banking enabled account of any other person but the tax should be paid in his name. Challan No. ITNS 280: For making payment of income-tax and Corporate tax (i.e. income-tax by companies). Challan No.ITNS 281: For making payment of TDS/TCS by corporate and non-corporate deductors/collectors. Challan No.ITNS 282: For making payment of Securities Transaction Tax, Wealth Tax and other direct taxes. Challan No.Form No. 26QB: For making payment of tax deducted at source in case of immovable property. General details to be provided in the Challans to be used for making payment of tax. Correct Permanent Account Number of the taxpayer should be entered in case of payment of income-tax and correct Tax Deduction Account Number of the deductor should be entered in case of payment of TDS/TCS. Correct financial year/assessment year should be selected. Correct address of the taxpayer is to be provided along with correct Pin Code. Correct e-mail ID and correct phone number of the taxpayer should be provided. Code 107 is for tax on distributed income to unit holders and Code 102 is for surtax. Code 0020 is for company deductees and 0021 is for non-company deductees. Correct selection of nature of payment should be made (i.e., TDS on salary, interest, commission, etc.) along with correct section. Code 0020 is for company deductees and Code 0021 is for non-company deductees. Selection of type of payment. In case of Form 26QB, by default there will be only one Code for type of payment, i.e., 800 (i.e. TDS on sale of property) and will be automatically selected. Permanent Account Number (PAN) of the transferee and transferor (to be provided in block letter). Category of the PAN of the transferee and transferor (will be automatically selected). Full name of the transferee and transferor. Address of the transferee and transferor. Selection for more than one transferee/buyer. Selection for more than one transferor/seller. Details of the property transferred along with complete address. Date of agreement/booking, sale consideration and type of payment (i.e., lump sum or on installment). Amount paid/credited (to be selected from the drop down provided). Amount of TDS and other details like rate of TDS, interest, fees, etc. Selection of mode of payment (i.e., payment through net banking or e-payment by visiting any of the bank branches). Date of payment/credit and date of deduction of tax at source. After selecting the correct challan, the screen for providing details will be displayed, the taxpayer should provide the correct details in the challan (as discussed earlier). After providing all the requisite details correctly along with the correct Codes, the taxpayer should select his bank from the dropdown provided in the screen (i.e. the selection of the bank from which he wishes to make the payment). After selecting the applicable bank, the taxpayer should input the verification Code appearing on the screen. After providing the verification Code the taxpayer should click on the proceed button provided on the screen. On clicking on the proceed button, a new page will be displayed containing the details provided by the taxpayer in the Challan and the name of the taxpayer as per the data base of Income-tax Department will be displayed. The name will be displayed from the PAN/TAN database with the Department. In case of Form 26QB the name of the transferor and transferee will be displayed. If the name and other details as displayed on the screen are correct then the taxpayer can proceed for making payment by clicking on the submit to bank button provided on the screen. On submitting the challan to the bank, the gateway of the bank will be displayed on the screen and the taxpayer has to login to his account and input the details of tax, interest, cess, penalty, etc., to be paid. After providing the details he should verify the details once again to check the correctness and then should submit the challan to bank for effecting payment. On successful completion of the transaction, the challan of payment (i.e., receipt of payment) will be generated and will be displayed on the screen. Challan will contain Challan Identification Number (CIN) and other details. The taxpayer should preserve the hard copy as well as soft copy of the Challan for his records and for further requirements. While making e-payment, if the taxpayer faces any problem at the NSDL website, he should contact the TIN call center. While making e-payment, if the taxpayer faces any problem at the payment gateway of his bank, he should contact his bank. Q1. Can a person pay direct taxes using the e-payment facility? With the development of technology, the Government has also upgraded itself, thus, as on today, there are two modes of payment of direct taxes (i) physical mode i.e. payment by furnishing the hard copy of the challan at the designated bank; and (ii) e-payment mode. Thus, option (a) is the correct option. Q2. 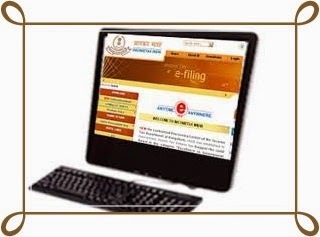 It is compulsory for every company to pay income-tax tax electronically. It is compulsory for the following taxpayers to pay tax using the e-payment mode only (i.e., using internet banking facility): All companies All taxpayers other than company who are liable to get their accounts audited as per section 44AB. Thus, the statement given in the question is true and hence, option (a) is the correct option. Q3. It is compulsory to pay income-tax using the e-payment mode for all the taxpayers other than a company who are liable to get their accounts audited as per section 44AB. Q4. A person not compulsorily required to pay tax electronically cannot voluntarily pay his tax by using the e-payment facility. A person not covered in the mandatory category can voluntarily pay his tax using the e- payment mode. Thus, the statement given in the question is false and hence, option (b) is the correct option. Q5. For making e-payment of taxes one should have only two things, an internet connection and a in an authorised bank. Q6. If the taxpayer does not have a net banking enabled account, then he can make e- payment using a net banking enabled account of any other person. Q7. The facility of e-payment of tax is available in case of income-tax and not in case of other direct taxes like wealth tax, securities transaction tax, etc. Q8. Which of the following challan is to be used for making payment of income-tax and Corporate tax (i.e. income-tax by companies)? Q9. Which of the following challan is to be used for making payment of TDS/TCS by corporate and non-corporate deductors/collectors? Q10. Which of the following challan is to be used for making payment of Securities Transaction Tax, Wealth Tax and other direct taxes? Q11. Which of the following challan is to be used for making payment of tax deducted at source in case of immovable property?